No English to Korean Questions on Korean Course? I've recently started using Duolingo's Korean course and noticed that there weren't any questions where I'm given something in English that I have to translate to Korean. 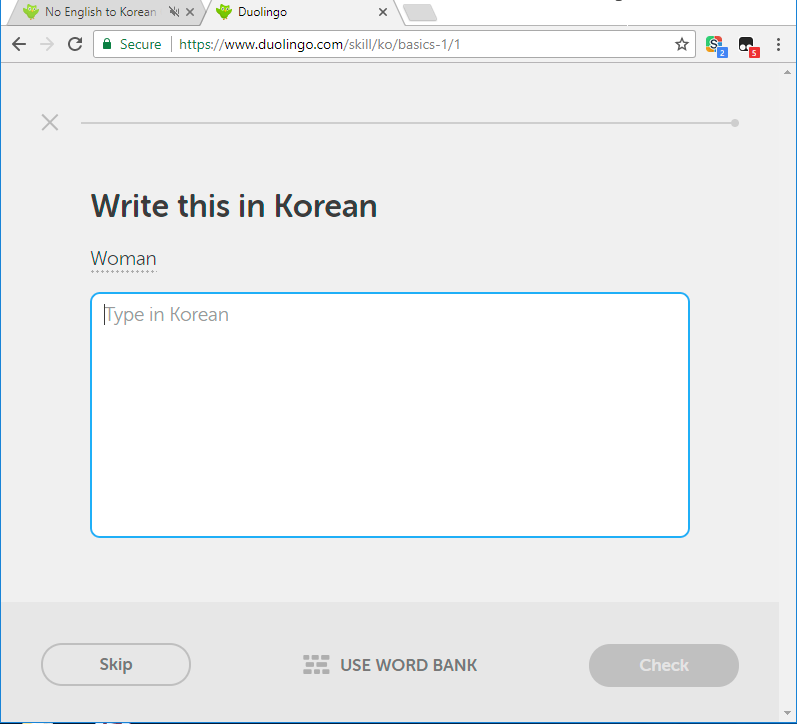 I have a Korean keyboard installed on my laptop so there wouldn't be any issues with input and this type of question would really help me learn the language. Are questions like this just not a part of the course or are there settings that I need to change? Thanks! Are questions like this just not a part of the course or are there settings that I need to change? In the course, there are some for me. Only a few, but it depends which lesson you're doing. I think there should be an option where English-to-Korean can be asked, but as a laptop user, it's a bit hard for me to type in Korean. Maybe contact the people in charge, see what they can do? but as a laptop user, it's a bit hard for me to type in Korean. I started shortly after it came out for desktop and nearly finished the course before being given the opportunity to enter answers in hangul. So I finished up, started over, and was pleased to find the tiles gone (except for the alphabet section) and lots of questions requiring translation into Korean. This evening, sadly, I am on a different computer, and the tiles are back, though not all the time. I have some questions requiring answers in hangul, but not as many as I would like. Like most serious students I hope DL will quickly do away with the tiles.. I can access hangul on this laptop by adding the language through the control panel the same way I did on my desktop. It's a 2 minute operation to make the change, and then a simple key stroke to switch back and forth between the keyboards.